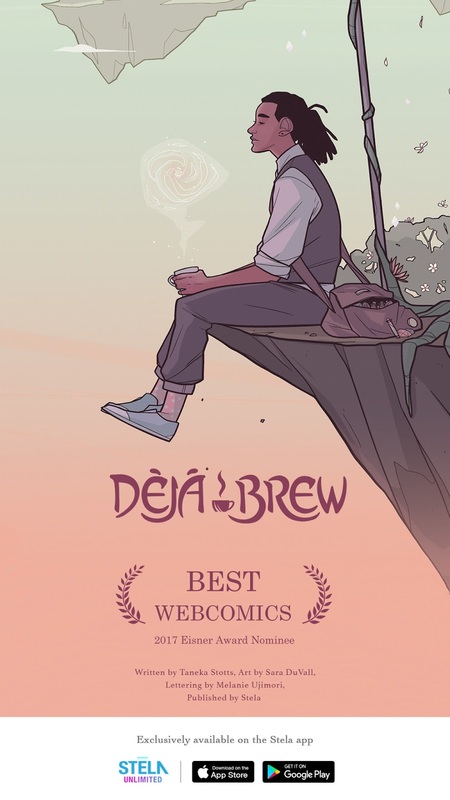 Stela LLC, providers of premium graphic novels and illustrated books native to mobile, today announced that two of its series, Jaeger and Deja Brew have been nominated for the 2017 Eisner Awards in the Best Webcomic Category. For nearly three decades, The Will Eisner Comic Industry Awards has recognized the creativity, talent, and excellence of creators in the comics and graphic novels industry. Nominees represent a diverse range of groundbreaking work that have achieved critical and popular acclaim. 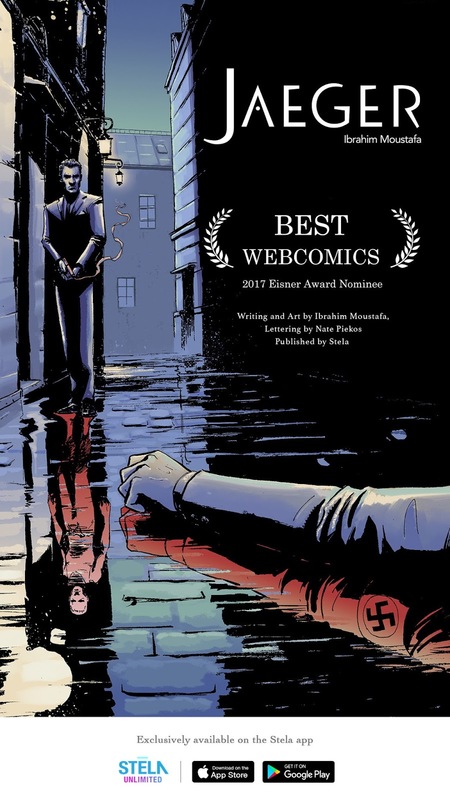 This year, for the first time in its history the Eisner Award is recognizing Best Web Comics as its own individual category. All works nominated in this category were originally created for digital consumption rather than print, recognizing a new tide of digital works that have brought the industry more than $100M in yearly revenue. Stela is leading this new wave of innovation in the digital medium, with an entire library of content created specifically for mobile consumption. Its flagship app, Stela Unlimited, allows readers to engross themselves in fantastic worlds and complex characters, focusing on comics that showcase a diverse range of viewpoints and subjects. Taking a more innovative approach than traditional comic publishers, Stela delivers comics, graphic novels, and visual books in the medium where today's consumers spend most of their time – mobile. Unlike print comics that are simply adapted for mobile viewing, Stela offers a rich storytelling experience uninterrupted by constant paneling, swiping, pinching or zooming. Readers simply need to scroll down and get lost in the worlds created by curated by editors from the heart of modern comics, and created by some of the most talented emerging and established names in the industry. "We are honored that the Eisner Awards has recognized the work of Stela's artist, validating our belief that works created for the mobile platform can be just as engrossing, inspiring, and enjoyable as traditional print comics," said Jason Juan, CEO of Stela. "Just as Netflix disrupted the television and movie industry with high quality original content, Stela is looking to do the same for mobile. Creating content for mobile devices serves millions of readers and empowers them to discover and follow stories in the medium they most frequently engage with." 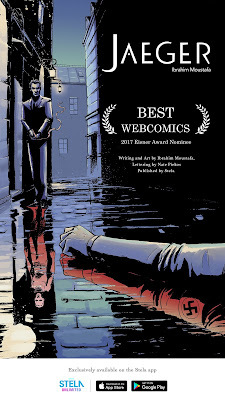 Two Stela titles are represented in the Best Webcomics category. Jaeger by Ibrahim Moustafa (High Crimes) tells the story of French-Algerian spy Idris Morel. Haunted by the torture he endured in a Nazi POW camp during World War II, Morel, hell-bent on exacting revenge against his captors, embarks on a one-man espionage mission to ensure that Nazi escapees are brought to justice. In his quest for revenge, Morel must find redemption, or risk becoming the very monster he hunts. Deja Brew by Taneka Stotts and Sara DuVall begins innocuously at Bijou, where expelled witch academy student Tobias works. When Ki, a frightened girl filled with someone else's memories, shows up at Bijou, it will put Tobias through the toughest magical test he's ever faced. Jaeger and Deja Brew were selected out of over 2,500 entrants sourced and solicited by the Eisner nomination committee. Winners will be chosen by a highly-lauded panel of blue-ribbon judges as well as by votes from leading industry professionals. The winners will be announced during an annual event at San Diego Comic-Con in July. Stela, LLC's flagship mobile visual content app, Stela Unlimited, is the first and only app to offer graphic novels and illustrated stories created specifically created for the mobile reader. With a library of unique and exclusive content by award-winning creators, Stela delivers the ultimate binge reading experience. Read to your hearts content and interact with a community of content creators and visual content enthusiasts with Stela Unlimited. For more information, visit stela.com.